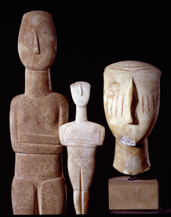 Almost more important than the works of art themselves from the Cycladic Islands around 2500 BCE is the debate around what they mean. In order to attribute some kind of meaning or used for these sculptures I think it’s important to first discuss how and where they were found. The archaeology of the Cycladic Islands is very sparse in some ways. They lived in similar kinds of buildings which were made of post and lintel technology as many other cultures across the globe. Some of their buildings were made out of cut stone and some occasionally were made from mud brick and were often not very permanent dwellings. 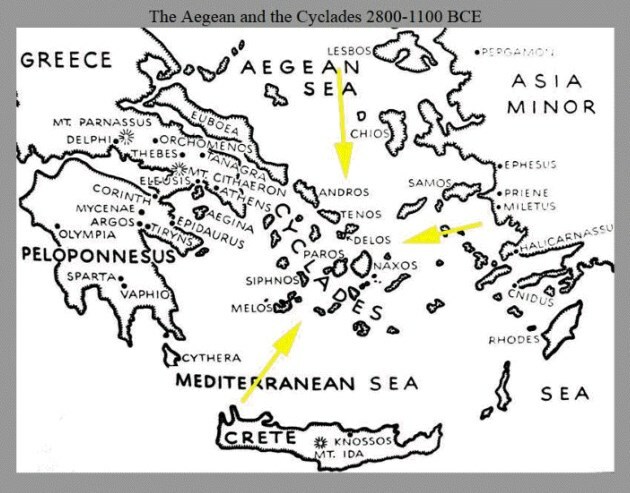 There are some later sites from around 1500 BCE that are more intact and so we can extrapolate that these people from the Cyclades lived a very simple life. A lot of their nutrition as well as usable disposable goods came from the sea, farming, and some herding of small livestock. These small statuettes or figurines, that were found across the islands, sometimes grave sites and sometimes in the archaeological digs of homes. They range in size from 6 inches to some being almost life-size. Where these goods were found does not give us as much information as we would like to help our interpretation of them. Some of the other stuff involved with these figurines is the fact that some of them were found broken in half deliberately and some had pieces broken off. The pieces of the sculptures were found sometimes in graves and sometimes other places. So we can’t assume that they were just funerary goods and we can’t assume that they were sculptures just for the home. A theory that might make sense about at least where they were used and exhibited and that also accounts for finding these pieces in graves might be a parallel to putting people’s favorite things in their graves with them. Sometimes someone will be buried with the book, or jewelry, or even a statue, or even a car even in our own world. Perhaps the statues were popular decorative items that were exhibited in homes and sometimes they were put in the graves. One of the sculptures was found in a grave and had been broken but was in a state of repair when it was placed in the grave. Signs of having fixed glue or some sort of adhesive were evidenced. What we can conclude from this is that while someone was alive and repaired and then placed in someone’s grave. Still this is not provide us with enough evidence or information to develop a very well-informed theory about how they were used. Perhaps, a more in depth formal analysis will let us understand it. Most of the statues are on the smaller side and are below 12 inches long. They are made of white marble and many have been painted with the type of paint called encaustic. Encaustic paint is made by melting beeswax and mixing it in with the colorant. Encaustic paint is the medium because the wax is the glue that holds the pigments in place. The colorants or pigments used to polychrome the sculptures were made from ground up earth minerals and sometimes just dirt. Black was achieved with carbon mixed with the wax. Yellows and reds exist in red ocher and yellow ocher in the soil. The reconstruction and also this work that shows some of the original pigmentation on one of the sculptures is not clear to us and what and where things are painted in general makes sense except for the dots or freckles that run across the bridge of the face. One of the heads almost seems like it has teardrops or vertical lines. The works all seem to resemble a female figure, this is with the exception of the harpists, that were found as well. They seem to have small breasts and a kind of upside down triangle has been incised in low relief that represents their private parts. The bodies all appear to be geometrically stylized and there are several theories about how the stylization came about. One scholar propose that the overall form of the body was designed with a compass and simply moving the compass point several times gave us the proportions of the figure. I’ve tried this with several of them and it doesn’t always work. But it’s a nice theory. The stylization also includes parts of the body being founded on slightly curved or rounded lines while in others there are sharp angular forms such as triangles and squares. The arms are crossed across the torso and are incised in low relief. Sometimes the details of the face are incised as well while the nose almost always is in high relief and based on a triangular form. 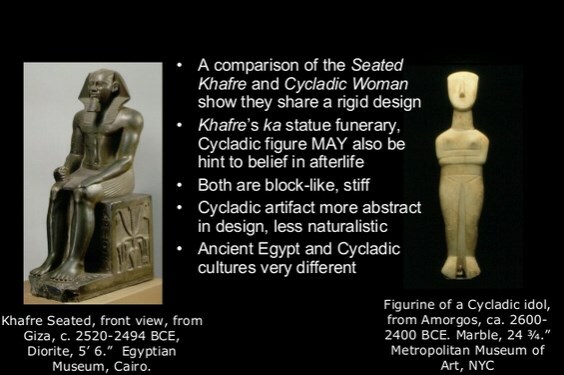 An obvious parallel that could help us understand some of these figures is to go back and look at some of the other sculptures that we’ve studied. 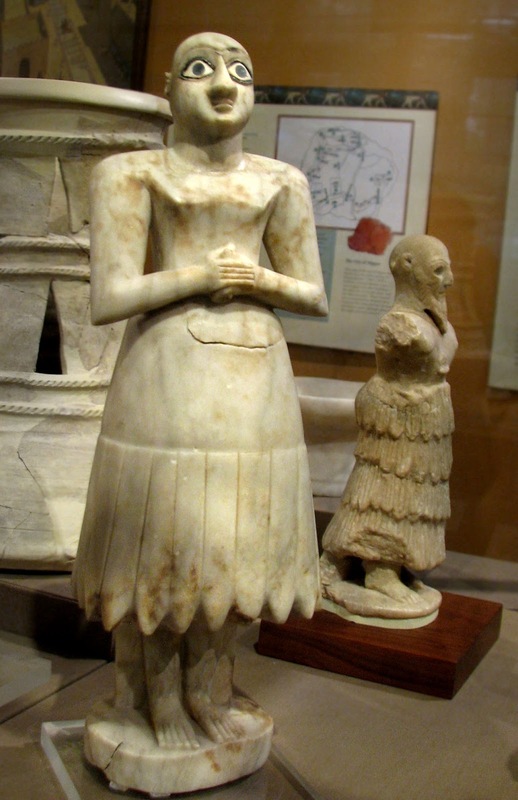 From Mesopotamia we have votive figures. From Egypt we have stand-in’s for the spirit of the deceased and sometimes just sculptures that represent living people. If we go back to the Neolithic era there is of course the famous Venus figurine. However, the Venus of Willendorf is the one we know the least about. From prehistoric Asia Minor we also have the seated goddess who had the cats on her throne. We can guess or extend what we know about these items to help us a little bit with the theory of what the sculptures probably mean. 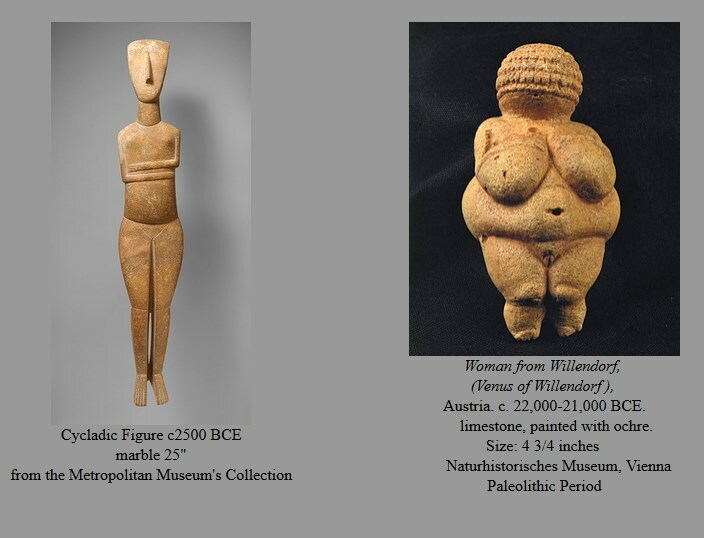 In many many cultures female figurines were found that represent motherhood and also fertility. 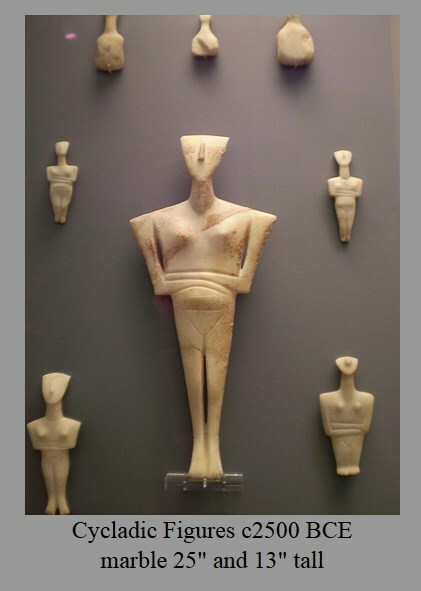 It’s probably the best guess and the most general for what we have found in the Cycladic Islands. This might account for why it was found in both grave sites as well as homes. However, this doesn’t account for a thin figure like these are. A theory might be that most people who lived in that environment were small and thin and those that were were most comfortable. This will make sense also in the evidence found from Knossos. Many depictions of the human figure share a similar body type where the shoulders are fairly broad and the torso is an upside down triangle and the bodies are fairly thin. They even share at Knossos the exaggeration of the shape of the eyes that we also see in Egypt as well as Mesopotamia. Remember that the Venus of Willendorf has three dots for eyes. The polychromy of some of the faces could be interpreted as just an attempt to exaggerate or define the facial structure, in a similar way that they exaggerate the eyes with make up in Egypt and also in how the eyes look from Mesopotamia. Our interpretations of these sculptures and the fascination with them are interesting to me. In the 1950s there was an art movement with some artists who decided to make figures very abstract. Many of the modern artists from the early 1900s such as Picasso, also looked to what they called prehistoric or primitive works of art. Picasso especially was fascinated with the arts of Africa, however, another artist named Henry Moore was very interested in creating semi-abstract interpretations of the female form. Critics naturally conflated the two works together and this is probably why these artifacts are part of the art historical Canon. A Canon is a standard or set of rules. For example there is a Canon of great literature. This can include Shakespeare and Hemingway. Get it?